Politics is something that affects us all but I wonder how many people, old and young, have a true understanding of how Parliament actually works. It turns out that a trip to the Palace of Westminster is a great way to gain an insight; what’s more, as British citizens we are all entitled to a free tour of the Houses (just contact your local MP). 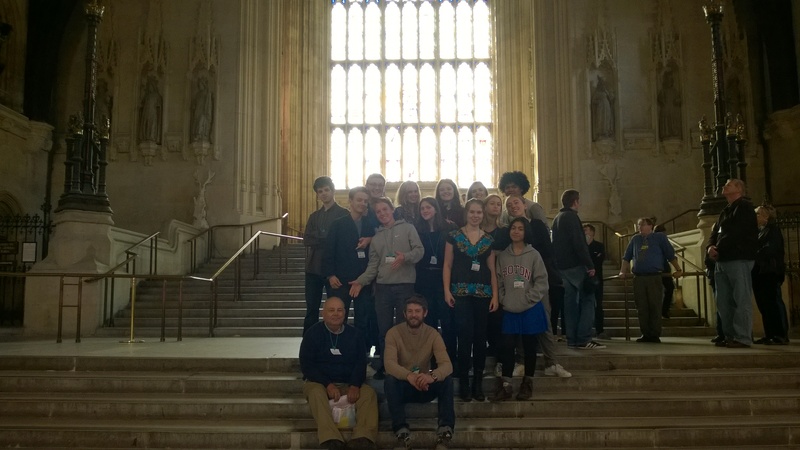 On Wednesday, I accompanied 6.1 Politics students and Alan, the Acting Head of Department, to Westminster. As always the Bedalians impressed me with their mature behaviour, excellent questioning, humour, knowledge and creativity, the combination of which made me smile, laugh and even at times shed a happy tear or two! We’ve just finished our tour of Parliament and have moved into the new education centre, opened just this autumn. I’m sat here in front of them, observing their participation in a parliamentary workshop, which they are fully engaged with. Sitting in two teams, red and blue, two primary colours that apparently have nothing to do with the parties. To my left are the reds and to my right the blues. Starting with a guess the country game, to warm up, the teacher calls out some bizarre laws such as it being illegal to kiss someone with a moustache. Moving on to the more serious stuff students were taken through the whole law making process via role play, with one student taking centre stage as speaker. Parliament started with a vote on which bill to debate, each party submitting their own choice to the ballot: the blues choose EU exit whilst the reds choose (in response) to burn the nationalists! Needless to say, the EU exit bill got voted in, under closed eyes to add anonymity. Had I kept my eyes shut, I might have been forgiven for thinking that the youngsters had been replaced by professional actors. The debate was excellent; well informed and serious despite its humour. George was leading the debate, it was a blue initiative, and he opened with an extremely strong and convincing argument about the freedoms and benefits associated with leaving the EU. The reds, however, were quick to come back with a counter argument based around immigration, asylum and equality for all. Post debate, more questions were posed to the students, all designed to inform or rather (with these students) test their existing knowledge. After which, we left Westminster and headed back to Waterloo where students shared their thoughts, proving that it was a great and educational day. ‘It was good to see how the British government works, now when I see British politics on the news I will know what they are talking about’ – Malik, Putney exchange student. Having been well informed of the key arguments from both sides in Wednesday’s Jaw, Bedales students and staff had the opportunity to participate in an in-school mini referendum last Thursday, voting on the same question as the Scottish electorate. Happily for the unionists, 75% of Bedalians voted ‘No’ out of a total 386 votes. In Monday’s evening assembly we compared the process of devolution in the UK with that of the management and structure of the Bedales Three Schools. Scottish independence would have been akin to Dunhurst becoming its own completely separate school. Instead, we established that the Bedales structure was more advanced than that of British governance, since each of the Three Schools has its own Managing Head, with Keith effectively operating as a Federal Leader of Westminster. The analogy could be pushed further, if we consider the debate over devolution for English regions. This would be like Steephurst, or 6.2 Flat, being able to set their own policies; seen in this light, students seem to agree that devolution for smaller regions may not be ideal! All Bedales students and staff have since been invited to participate in a competition run by Parliament to write a 350 word preamble to a hypothetical new codified British Constitution. Parents are also welcome to enter; further details of the competition can be found here. Over recent weeks, Politics students from both 6.1 and 6.2 have enjoyed full-day immersive experiences in “academic politics from an examiner’s perspective”, in the novel locations of places of worship in London, chosen specifically to encourage students to be reflective. 6.2 students, following a course in applied US politics and government, were led through talks whose titles ranged from the relevance of the Electoral College as a means of electing modern Presidents through to an assessment of whether the US Supreme Court has too much power for an unelected body. The talks led to lively debate and conversation on the train back to school, with students particularly focusing on whether the UK would benefit from a more presidential-style of government. Happily for David Cameron and the Con-Lib Coalition, they voted to keep the status quo. The course for 6.1 politics students is firmly centred in the politics and governance of the UK. Their talk titles covered a range of fascinating topics, examining the role of pressure groups such as Frack Off, Action for Children and Fathers for Justice and the balance of power between the Commons and the Lords, amongst others. The clarity of the speakers, combined with their excellent insight into the examinations system and consequent focus on essay technique and the requirements of forming a balanced argument, meant that both days were a resounding success. 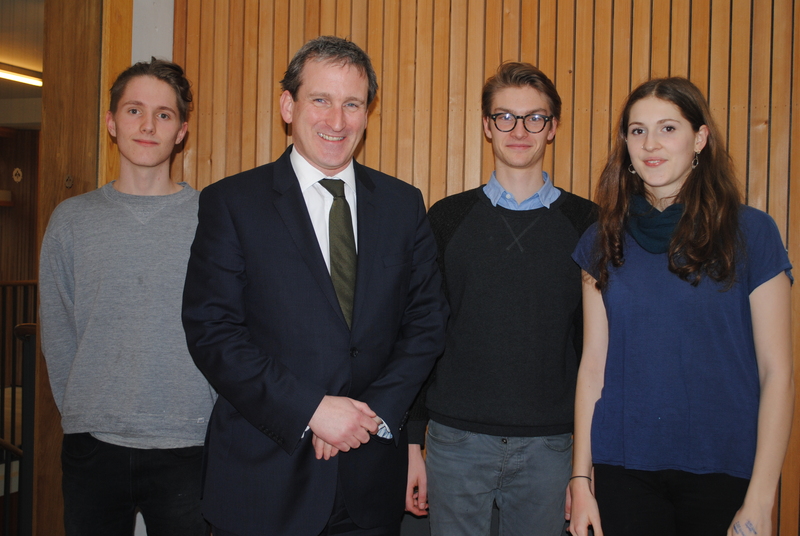 Last Friday, the local Conservative MP for East Hampshire, Damian Hinds visited Bedales to discuss with students the mechanics of Parliament. After joining a group of Bedalians for lunch, Damian spoke to a collection of Politics students and those who were curious to find out what the MP had to say. The talk provided an insight into the true procedures of Parliament allowing for a Q & A in which many Bedalian’s main focus was towards current affairs. This led to in-depth discussions with the MP which shed particular light on events including the present relationship between the Coalition and the Opposition, which led to Damian revealing the series of events contributing to David Cameron’s failed attempt for possible military action in Syria. This helped us to question the Government’s relationship with Parliament from a unique insider’s perspective. Overall it was a talk in which all the students left with a more rounded view of our government today. The Politics Society was most fortunate to be addressed by Graham Riddick on 16 October. Graham had been elected MP for Colne Valley in Lancashire (the first conservative there for 102 years!). He won the seat in 1987 at the end of the Thatcher era. He had some fascinating stories to tell us about Thatcher (not as imperious in person as presented in the press). His contention that it was The Poll Tax and not Europe that led to her downfall was useful to Historians as well as Politics students. Graham told us how he had become involved as politics. His grandfather Sir Edward Ruggles-Brise was MP for Maldon in Essex and this sparked an initial interest. He expanded on the role of an MP and was able to clarify political complexities brilliantly (Politics, he contended, is essentially an argument about Big Government or Small Government, whether in Britain or America). He favoured small. He also spoke about media intrusion (he had himself been the victim of a sting by The Sunday Times and although he was fully exonerated he still found it difficult talk about – but still favoured a free if more responsible press). He spoke with an infectious enthusiasm which held the audience’s attention and the questions which followed were lively and thought-provoking. This was a warm and intelligent address from a knowledgeable politician and was greatly appreciated and enjoyed by all those present.